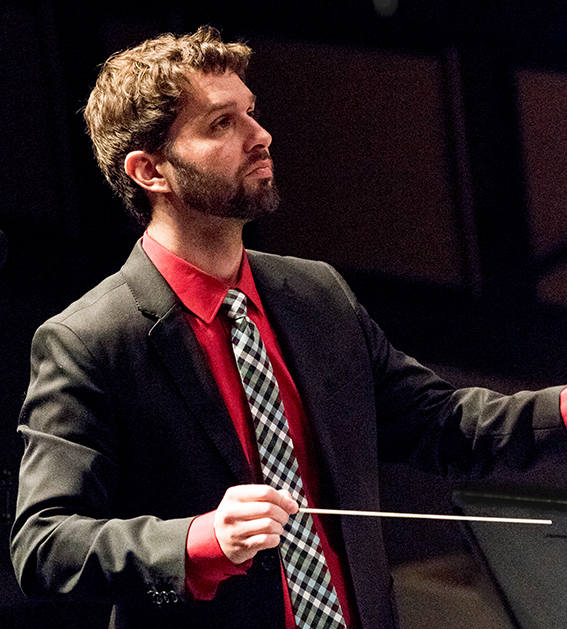 A native of Lake Orion, Michigan, Spencer Aston is Assistant Professor of Music at Bridgewater State University where he leads the BSU Bear Band and teaches applied trumpet lessons and various music theory/history courses within the department. Prior to his appointment at BSU, he served on the faculties at UMass Boston, Boston University, and the University of New Mexico. Dr. Aston maintains a highly active performance schedule throughout New England. As a conductor, he is comfortable leading any combination of musicians in the orchestra or wind band literature. Aston played a major role in the creation of an orchestral program at the Powers Music School where he currently serves as the Director of the Massachusetts Youth Symphony Project as well as principal conductor for the Chamber Orchestra. He is also the Music Director of the Windham Concert Band in Windham, NH. As a trumpet player, Dr. Aston holds regular positions in the Atlantic Symphony Orchestra, the Glens Falls Symphony (New York), and the New England Symphony Orchestra. Other orchestral appearances include the New Bedford Symphony, Odyssey Opera, Orchestra of Indian Hill, and the Cape Symphony. Dr. Aston is an active adjudicator and clinician for competitions and educational ensembles including most recently the MMEA Central District Festival Junior Orchestra, the National Trumpet Competition, the Brookline Symphony Concerto Competition, and the BSU Jazz Festival. He earned the Doctor of Musical Arts degree from Boston University, Master of Music degree from the University of New Mexico, and Bachelor of Music degree from the University of Cincinnati-College Conservatory of Music. His primary conducting teachers include Charles Peltz and Dr. Terence Milligan. Site © by Mercury Orchestra. Photos © 2009 by Timothy Yu. All rights reserved.